WORLDWIDE: DNV GL says the growth of electrification by 2050, and the resulting increase in wind and solar power, will require "major regulatory intervention". "High fractions of solar and wind will create a need for increased use of market mechanisms and changes to the electricity market fundamentals in many countries," the advisory body said as it launched its Energy Transition Outlook (ETO) 2018 report. "This requires major regulatory intervention. Market based price signals are crucial to incentivise innovation and develop economically efficient flexibility options," it added. The report, now in its second year, looks at the energy system as a whole, making long-term predictions based on current policies and speed of deployment. Its report finds energy demand will reach a peak by the mid-2030s – slightly later than it predicted in 2017’s report – of 470 exajoules/year (EJ/year) reducing slightly thereafter to 450 EJ/year by 2050. However, by 2050, electricity will play a much greater role in the final energy demand, DNV GL said. In 2016, electricity made up 19% of demand (75 EJ/year), but by 2050 its share will increase to 45% (over 200 EJ/year). 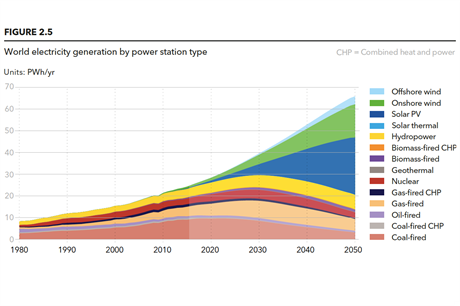 Electricity will displace coal and oil in the final energy mix, DNV GL predicted. "Fossil fuel’s share of the primary energy mix ill decline from 81% currently to about 50% by mid-century," DNV GL added. So, with greater electrification of the energy system, but falling importance of fossil fuels in electricity production, a gap is left for low-carbon generation, and in particular, for renewables. DNV GL predicted biomass, hydropower and nuclear to remain "practically flat" in the energy mix. Wind and solar, therefore, will "grow rapidly" to 12% and 16%, respectively of world primary energy supply by 2050. As shown in the chart, above, wind and solar power grow to a 29% and 40% share, respectively, of total electricity generation by 2050. With that growth, DNV GL said thermal generators, including nuclear, will increasingly perform a peaking role in the system, and the term ‘baseload’ "starts to lose its meaning".. Despite the rate of change predicted by 2050, DNV GL said it was not enough to meet the targets set in the 2015 COP21 Paris Agreement. DNV GL found the first emission-free year would not be until 2090, at the current rate. "Additional measures should be taken to put the world on a pathway to avoid severe climate problems. "Policy makers can put in place measures to incentivise a demand shift towards clean energy, to stimulate innovation in new efficient and clean technologies," the report stated. Ditlev Engel, DNV GL Energy’s CEO, pressed this point putting pressure on a concerted effort from all, but in particular policy makers, to speed up the clean energy shift. "The Energy Transition Outlook has some very encouraging findings, and the good news is that the energy transition is achievable and affordable," Engel said. "However, the rapid transition we are predicting is still not fast enough to achieve the goal of the Paris Climate Agreement. "If we are to decarbonise the world’s energy system at the required speed, we need to adapt and automate our electricity grids, and regulators and politicians will need to re-think, re-shape and take major policy decisions about market models."